Nicely updated & very charming 3 Bedroom, 1.5 Bath, 1,727 sq. ft. two-story home built in 1928. Rare 2 car detached garage plus 1 car carport & 3 open parking spaces! Very conveniently located on Jacksonville’s northwest side in the Murray Hill area, near I-10, downtown Jacksonville, airport & more. Eat-in Kitchen with pantry, double-bowl sink, white appliances: microwave, dishwasher & oven. Warm & rich real hardwood floors in most rooms; Newer earth-tone tile flooring in Kitchen, Dining Area, Baths & Florida Room. Master Bedroom features built-in drawers. 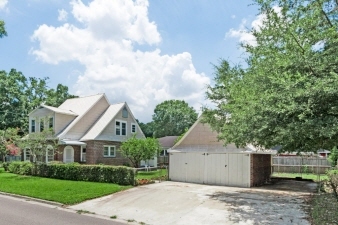 Exterior Features Pretty corner lot (50’x115’) dotted with shade & fruit trees; partially fenced backyard. Additional Features and Amenities Sunny & bright freshly painted textured walls with lots of windows; Arched doorways add charm.